Post Hill Press, 2018(NEW YORK) — Spencer Christian became a household name as weatherman, feature reporter and co-host of Good Morning America during the late 70s and early 80s. 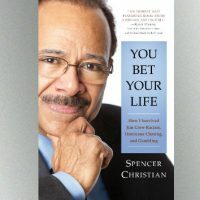 While he managed to maintain his public persona, Christian struggled with a serious gambling addiction, which he documents in his new memoir You Bet Your Life: How I Survived Jim Crow Racism, Hurricane Chasing, and Gambling. With his gambling addiction is behind him, Christian is opening up about his story and the important message he has. According to Christian, it’s a lot of hard work to “repair damaged relationships” and to reclaim one’s life after a seemingly debilitating fall. However, he believes if he can do it, anyone can. “And that’s what I hope people will get from this — I hope that my falling to rock bottom, several times, and bouncing, back will serve as a source of hope that anyone facing any kind of adversity or difficulty can can bounce back,” he says. You Bet Your Life: How I Survived Jim Crow Racism, Hurricane Chasing, and Gambling is available now from Post Hill Books.